I don’t know about you, but I’m a huge kid at heart when it come sto Easter baskets. 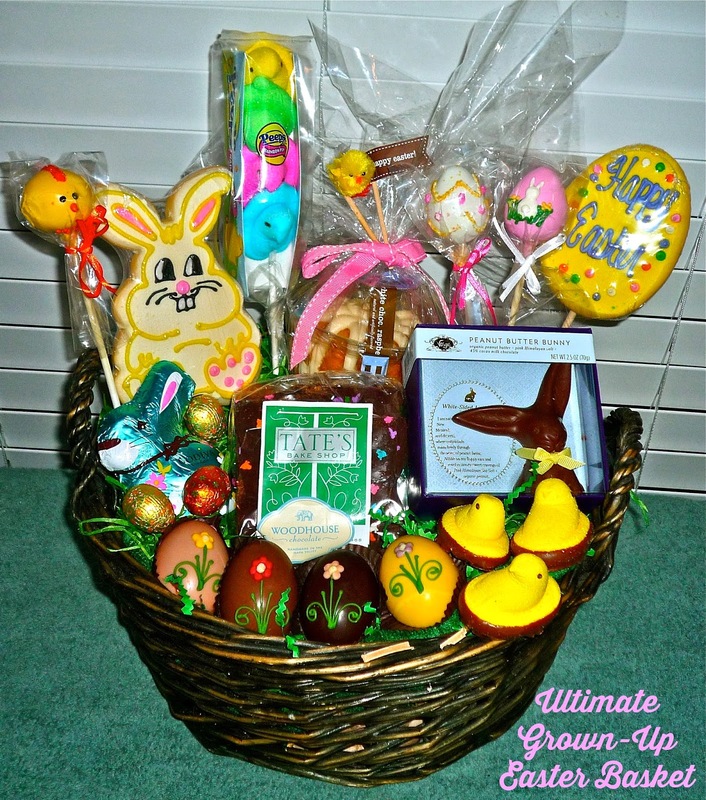 I may be a long way from the glory days of my youth, but I love to create Easter baskets overflowing with fun and tasty sweet goodies! This year, I decided to create my ultimate Easter basket by partnering with some of my favorite bakeries and sweets makers. Want to make the Big Kid in your life grin ear-to-ear on Easter morning? My Grown-Up Easter Baket is a perfect start! You migth want to make sure you have some stretchy pants handy, because you’re gonna need them after sampling all these fabulous goodies!! (1) Woodhouse Chocolate is based in Napa Valley and offers some of my favorite artisan chocolate. 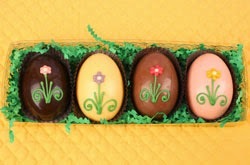 Their Easter chocolate collection includes these pretty hand-decorated Flowered Eggs. They come four to a box, each with its own unique flavor. The dark egg is Dark Chocolate Truffle, the yellow is Mandarin Orange, the milk is Praline Noisette, and the pink is Strawberry Caramel. Any chocolate lover will totally flip to taste these handmade chocolates! (2) Eleni’s Cookies is based in New York and is offering a fun cookie tin that takes Easter egg decorating to new levels! Their Color Me! Easter Egg set comes with a dozen egg-shaped cookies topped with smooth white royal icing…along with a selection of colorful edible-ink markers. First you have fun hand-coloring the cookies. Then? You get to eat your delicious creations! This is a creative and fun gift for kids of all ages…and it’s a lot less messy than coloring real eggs. As you can see, I had fun decorating a cookie or two myself. 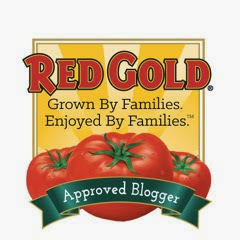 I just love this creative idea from Eleni’s!! (3) Godiva is offering a large collection of Easter items this year, but I was totally smitten with Hopsy the Bunny. This fluffy stuffed collectable Gund bunny comes with Godiva 2014 stitched on one of his feet, so you can use him as the centerpiece of your Easter décor for years to come. He even comes bearing an organza sack full of foil-wrapped Easter eggs in Dark Chocolate Ganache, Raspberry Ganache, Milk Chocolate, and Almond Butter. I also love Godiva’s foil-wrapped solid chocolate bunnies. 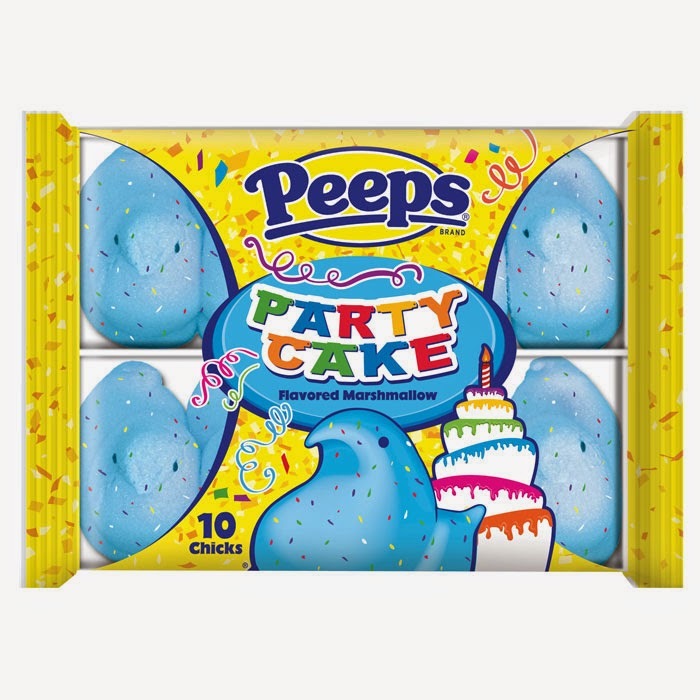 It’s a gourmet take on a classic from childhood…and I love the pop of color from the decorative wrapping! (4) Vosges Haut-Chocolat is based in Chicago and makes some of the tastiest and most creative artisan chocolate anywhere. Their whimsical Easter lineup includes a trio of flavored chocolate bunnies that are long on ears and big on flavor! My Easter basket features their Peanut Butter Exotic Flop-Eared Bunny. Outside, he’s 45% deep milk chocolate…and inside, you’ll find organic peanut butter and Himalayan Pink sea salt. This is a generous 2.5-ounce bunny that’s downright addictive…be sure to start with the ears! Other flavors in the Vosges Flop-Eared Bunny line include Barcelona (45% deep milk chocoalte, sea salt, and hickory-smoked almonds) and the Toffee (45% deep milk chocolate, sweet butter toffee and Pink Himalayan sea salt). (5) Tate's Bake Shop offers some of my favorite chocolate chips anywhere. They're buttery, thin, and perfectly crispy. For Easter, they're upping the ante, turning their cookies into Easter Cookie Bark. This confection includes Tate's chocolate chip cookies covered with intensely dark chocolate. The bark is topped with colorful sprinkles, wrapped in cellophane, and packed into a decorative box. It's downright addictive! 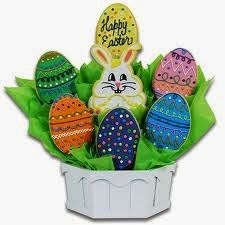 Want to buy some of this bark for your Easter celebration? 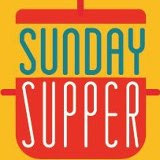 Tate's is offering The Weekend Gourmet Readers 20% off all online orders through Easter! 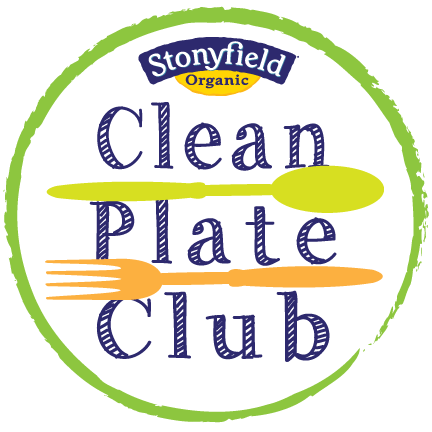 To redeem this offer, simply enter the code RealSimple at checkout. fun for the chocolate lovers too! (7) Cookies by Design is a company based in Texas that specializes in gift baskets featuring colorful decorated cookies. Each cookie is festively hand-decorated, individually wrapped, and placed on skewers as pops. Then, they’re arranged in a basket, wrapped and decorated, and delivered anywhere across the country. I absolutely fell in love with their Easter collection, which includes decorated cookie eggs and an Easter Bunny. The sugar cookie base is tender and sweet, and the icing is delicious. These cookies are a fabulous addition to any Easter basket…and their cookie baskets make excellent gifts to send your loved ones too! (8) Sweet Lauren Cakes is a bakery based in San Francisco that specializes in adorable decorated cake pops. Lauren’s Easter line includes adorable hand-decorated chicks, Easter eggs, and bunnies. Not only are they totally cute, they’re also delicious. The cake pops arrive safely packaged and individually wrapped for freshness, so the pops remain moist and flavorful until you’re ready to serve them. 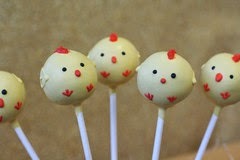 Who wouldn’t want to find these precious and fun cake pops in their Easter basket? 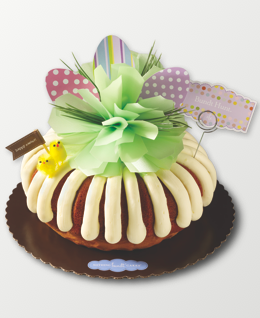 (9) Nothing Bundt Cakes offers their Bundtlets all dressed up for Easter. Theirfeatured flavor this month for Easter is White Chocolate-Raspberry. They’ll even wrap the Bundtlet container in clear wrap, tie it with a seasonal bow, and include Easter décor like a fluffy yellow chick and a Happy Easter banner. It can be given as is for a one-off Easter present…or as the centerpiece of your own Grown-Up Easter Basket. If you’ve never tried Nothing Bundt Cakes, you’re in for a treat! Their bundts are moist and flavorful, and the cream cheese-based icing is rich and just-sweet-enough. If you're looking for a full-sized Easter dessert for your family meal, look no further than their festive Bundt Hunt Easter cake! There you have it! Whether you incorporate these goodies into your own Grown-Up Easter basket for that special someone in your life…or surprise them with a select item or two from the list…you can’t go wrong with any of these delicious hand-selected Easter goodies! These eight items are guaranteed to bring a smile to friends and family on Easter morning. 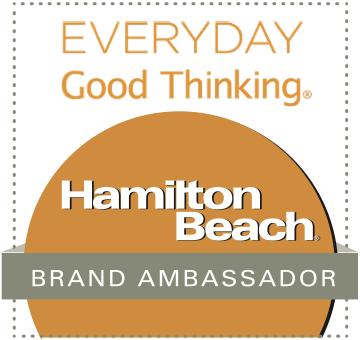 Disclosure: The companies featured in this article provided me with samples from their Easter lines to facilitate inclusion in this article. All items were hand-selected by me, and no further compensation was received. As usual, my opinions are solely my own. I love these items, and I think you will too!